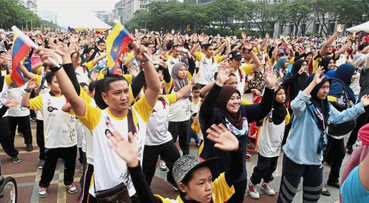 KUALA LUMPUR: Exercise medicine, which is increasingly gaining acceptance in Malaysia, has the potential to reduce the risk of contracting non-communicable diseases (NCDs), according to medical specialists. Though the government has yet to legislate exercise as a form of treatment for chronic diseases, doctors feel that prescribing the right dosage of exercise to patients suffering from early NCDs, such as hypertension, diabetes, obesity and dyslipidemia (having unhealthy levels of one or more kinds of lipid [fat] in the blood), can be a first course of treatment. Medical specialists feel that exercise therapy, which has the potential to be an alternative remedy to conventional medicine in preventing NCDs, has produced many positive changes to the human body if executed in the right manner. According to Dr Hashbullah Ismail, who heads the clinical exercise physiology and rehabilitation unit under the Faculty of Sports Science in UiTM, Shah Alam, exercise training can be part of efficient therapeutic approaches to improve quality of life. “A systematic review which reported data from 16 countries found that over two-thirds of the countries surveyed reported improved quality of life in chronic heart failure patients who exercised,” he told Bernama in an interview here. Urologist Dr Goh Eng Hong said exercise and physical activities generally were regarded as tools in managing metabolic diseases. “Evidence is increasingly showing that exercise is also beneficial in the disease progression of cancer, ranging from prevention to palliation, whether physiologically or mentally,” he said. Head of physiotherapy department of Lincoln University College in Petaling Jaya, Dr Ravikumar Katta, said exercise could be used as a “medicine” for managing established Alzheimer’s disease. “The regular practice of walking improves cognition in Alzheimer’s disease, while strength training is more effective for improving postural and motor function, and reducing the risk of developing Alzheimer’s, since it improves muscle mass and strength,” he said. Meanwhile, exercise medicine expert Prof Dr Lee Chee Peng said Malaysia would be hosting the second World Conference on Exercise Medicine (WCEM) in Melaka from Sept 24 to 26. Lee, who is WCEM vice-chairman, also called for the setting up of an exercise clinic in all districts in the country to encourage behavioural change to reduce the risk of getting NCDs. He also said the long-term effects of breastfeeding in preventing NCDs would be one of the key topics to be deliberated during the conference. The Health Ministry has said an estimated 73% of the total deaths in government hospitals were due to NCDs. AFP also reported doctors as warning that more than 1.4 billion adults are putting themselves at heightened risk of deadly diseases by not getting enough exercise, with global activity levels virtually unchanged in nearly two decades. “Insufficient physical activity is a leading risk factor for non-communicable diseases, and has a negative effect on mental health and quality of life,” the report quoted the study of world exercise levels published by The Lancet Global Health Journal.